The Rally-X is one of Pac-Man and Ms. Pac-Man's special items in Mario Kart Arcade GP, Mario Kart Arcade GP 2, and Mario Kart Arcade GP DX. 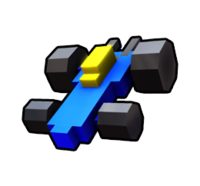 The item is based off the car driven by the player in Rally-X. Upon using the Rally-X, the user will deposit three clouds of pixelated smoke onto the racetrack in succession. Any racer who runs into one of these clouds will lose speed. This page was last edited on March 4, 2019, at 15:12.